Korean rice farmers protesting in Seoul against any new imports under an agreement with the World Trade Organisation. Credit: Ahn Mi Young/IPS. SEOUL, Apr 24 2014 (IPS) - Rice, a staple of the South Korean diet, is stirring up a bowlful of worry for Seoul. Under a promise to the World Trade Organisation (WTO), the government has to make a tough choice on rice imports by June this year. It can either allow foreign suppliers to sell rice in its market – that is, open up its rice sector to the world – or it can continue to import a fixed quota of rice annually from countries like the U.S., China and Thailand. To open up its rice market or to stick to an import quota – the decision will not be easy for Seoul. While opening up the rice market would bring competition for local varieties of the grain – and in turn invite the wrath of Korean farmers – the second option would mean allowing a huge quantity of foreign rice despite little domestic demand for it. The government’s dilemma comes at a time when rice consumption is falling in the country. South Koreans no longer have the “peasant diet” – a full rice bowl, a bean fermented soup and the spicy vegetable dish kimchi. They often dine out and opt for other menus. Often, women on a diet cut down their rice intake. An average South Korean who used to eat 130 kg of rice a year in 1982 and 112.9 kg in 1992 ate only 67.2 kg rice in 2013, according to agriculture ministry data. Despite such a trend, the government has to take a decision soon. In 1993, when the Korean government tried to open up the rice sector, tens of thousands of angry farmers gathered across the nation to protest. “Opening up the rice market is like giving away the country’s food sovereignty”, their slogan said. The government then promised farmers it would not liberalise the rice sector. WTO instead allowed South Korea a concession in the form of minimum market access (MMA) norms. This system meant Seoul would have to permit a specified quantity of rice to be imported under an annual quota. Thus, in 1994, South Korea began to import four percent of its annual rice consumption. In 2004, this agreement was extended for another 10 years, with the condition that the annual quota of imported rice be increased by 20,000 tonnes each year. As a result, rice import under the quota jumped from about 225,000 tonnes in 2005 to 408,000 tonnes in 2014. The current quantity imported under the quota amounts to about 10 percent of the country’s total rice production, which was 4.23 million tonnes last year. The major sources of its rice imports are China, the U.S. and Thailand, and it also buys from India, Vietnam and Cambodia. But few South Koreans buy foreign rice, because of their strong preference for the “delicious” homegrown variety. Most of the imported quota rice is sold to food, liquor or confectionery companies but these too increasingly use more of Korean rice because of consumer preferences. Seoul’s agreement with the WTO on the current import quota expires at the end of 2014. It must decide by June so that it can notify the WTO of its decision by September. Seoul has said the WTO is unlikely to allow any further delay in opening the rice market. Such a proposal from Seoul would have to be ratified by the WTO. “The key issue would be how high the tariff on imported foreign rice can be,” agriculture minister Lee Dong-Pil said at a press meeting in March. Currently domestic rice sells for 162 dollars per gamani (80 kg). If South Korea imports the cereal at 60,000-70,000 won (56-65 dollars) per gamani and imposes 400 percent tariff, imported rice will cost about 280 dollars per gamani. The government also believes that settling for an import quota yet again – and thereby buying greater quantities of foreign rice – will not help the country. “Another delay will not benefit South Korea,” minister Lee said, referring to a growing stock of imported rice. Talk of opening up the rice market has already spurred farmer protests. Hundreds of them gathered in Seoul on Mar. 13 to oppose free import of foreign rice. “As we plant rice saplings in our fields, we also sow the seeds of worry in our heart,”, said a placard at the demonstration. “We will never accept an opening up of the rice market” read another. There are 1.15 million farmers in the country and 494,352 of them are engaged in rice cultivation, according to 2012 data from the Korean Statistical Information Service. 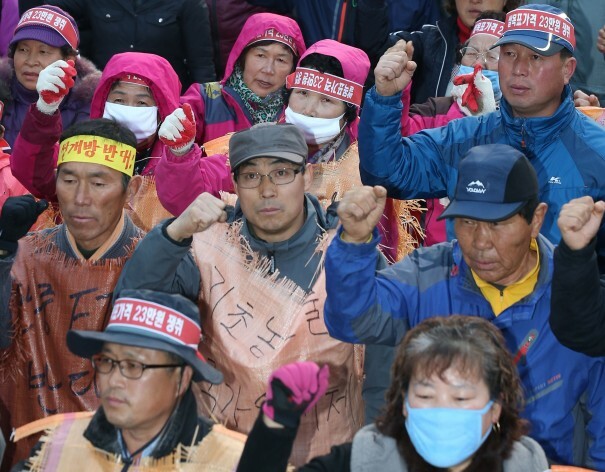 Last month about 10,000 farmers gathered near a Seoul building where trade officials from South Korea and China were meeting for a bilateral free trade deal that would allow these two countries to increase trade between them by reducing or removing tariff on imports. “Once a free trade deal is made between Beijing and Seoul, how can Seoul impose 300 percent tariff on Chinese rice?” asked Lee Byong-Gyu, who was leading the farmer group.